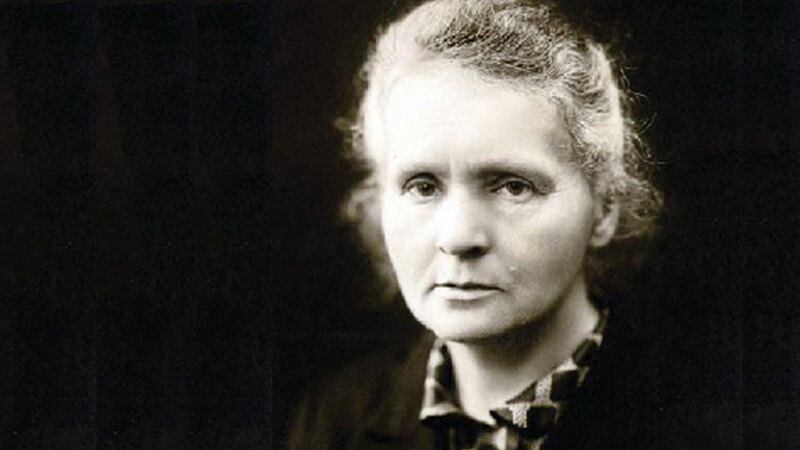 How little Manya Sklodowski (Marie Curie) became the first woman to earn the Nobel Prize in Physics, and the first person ever to earn a second Prize, is a fascinating story. In 1865, American T.S.C. Lowe invented the ice-making machine. In 1866, Alfred Nobel invented dynamite, Ernst Haeckel coined the term ecology, and people considered cholera outbreaks to be God’s retribution for moral failure. Such were the times into which Vladislav and Bronislava Sklodowski’s fifth child was born in Warsaw, Poland. They affectionately nicknamed her Manya—a pet form of Maria—though affection appears to have been a scarce commodity in the Poland of 1867. Under the ever oppressive eye of Russian overseers, the infant’s father, a physics teacher, was closely watched, as were all the intelligentsia. In time, deeming it unsuitable for the Polish masses, the Russian supervisors began removing science from the school curriculum. As it was no longer appropriate for Professor Sklodowski to bring physics equipment from home for his classes, it remained in his study: barometers, shiny tubes and objects in glass cabinets. Even as a youngster, the curious Manya was fascinated by these baubles. Soon demoted from his position at the school, and with his wages and living allowance reduced as a result, Sklodowski attempted to ensure a continued income by investing his savings in a brother-in-law’s business. He lost it all. The family was forced to move several times and eventually took in boarders—boys whom the professor fed, lodged and taught. Along with those boys came typhus, and in 1876 Manya’s eldest sister died. Her mother died two years later from chronic tuberculosis. Only then did 10-year-old Manya understand why her mother had never once kissed her. As a teenager Manya would often meet a girlfriend on the way to school. In the courtyard of the building where her friend lived stood a brass lion with a ring in its mouth; if her friend was not there waiting, Manya would lift the ring up over the lion’s head as a signal that she had gone on ahead. Her life would play out in the same fashion—moving ahead of others and blazing a trail—a trail that eventually led to the atomic bomb. Today we know this child not as Manya Sklodowska but as Nobel laureate Marie Curie. How little Manya became the first woman to receive the Nobel Prize in Physics, as well as the first person to earn a second Nobel Prize, is a fascinating story. Though her life of tragedy, sacrifice and diligence is extraordinary, the result of her scientific work radiates great irony. In 1888, Manya’s father, now retired on a meager pension, accepted the cheerless job of reform school director. With it came an income that could be set aside for his youngest daughter’s formal education. But Manya, now 21, had lost interest in education. For the past three years she had lived as a governess in the country, earning money to support her older sister’s medical education in Paris. Moving back to Warsaw, however, she began to associate with the so-called floating university, a free-thinking youth underground. This wakening taste for research sparked her latent curiosity and propelled her to a life of science. In the autumn of 1891, the 24-year-old departed Poland on a fourth-class train ticket to Paris, and by 1894 she had earned degrees in physics and mathematics at the Sorbonne. She would soon become head of the physics laboratory there and go on to earn her doctorate in 1903. While seeking to find a workroom in which to carry out research in magnetism, Manya, called Marie by her French colleagues, met Pierre Curie, a professor at the School of Physics and Chemistry. His primary interest was crystal structure, but he found Marie fascinating as a scientist, someone totally driven and committed to her work. On a research paper he sent to her, he annotated: “To Mlle Sklodovska, with the respect and friendship of the author, P. Curie.” According to Eve Curie’s 1937 biography of her mother, Pierre considered Marie a girl who “had the character and gifts of a great man”: genius, devotion, courage and nobility. Marie later wrote that “for Pierre Curie there was only one way of looking at the future. He had dedicated his life to his dream of science: he felt the need of a companion who could live his dream with him.” She returned to Paris in October and married Pierre in July 1895. Daughters Irene and Eve would be born in 1897 and 1904 respectively. Meanwhile in 1896, Henri Becquerel reported discovering radiative emissions from uranium salts. Using an apparatus designed by Pierre, Marie began to analyze and quantify these “Becquerel rays.” She discovered that the phenomenon, which she called radioactivity, was a characteristic of materials beyond uranium and thorium; indeed, it was a property of matter related to what we now know as nuclear change and the fission or transmutation of atoms. These initial discoveries edged open the door to the physics of the atom itself. In 1898 the Curies published their first account of a new radioactive substance. They named the element polonium in honor of Poland. Soon after, they isolated a second element, radium, a million times more radioactive than Becquerel’s original salts. Over the next few years, already fighting illness and fatigue now known to have been caused by the radiation exposure inherent in her work, Marie went on to purify one decigram (0.1 g) of radium. This was enough to confirm that it was indeed an element and could be identified by weight and later by half-life. In recognition of this work, which in essence created the field of nuclear chemistry, Marie would become the first person (and to date the only woman) to win a second Nobel Prize, this time the 1911 prize in chemistry. In the interim, a radium “industry” had been born as scientists around the world sought to work with the substance. For example, the first radiation therapy, called curiethérapie in France, miraculously destroyed tumors when infected skin was exposed to radium. In addition to sparking the advent of radiology, radium was also used to make dials glow and even to power a rudimentary atomic clock. Having created the processes of purification, the Curies could have reaped great wealth from their work. Humbly and true to form, they determined to publish their research completely without patents or the kinds of restrictions so prevalent today. “If our discovery has a commercial future,” they said, “that is an accident by which we must not profit.” It soon became apparent that the radiation resulted from atomic decay, the breakdown of atoms. Atomic energy was now at hand. In Eve’s biography, she relates the philosophy of scientific dedication learned from her parents; the Curie family continued in that service and science orientation. Irene, with her husband Fredrick Joliot, received the Nobel Prize in Chemistry in 1935 for their creation of radioactive elements. And as director of the United Nations Children’s Fund (UNICEF), Eve’s husband H.R. Labouisse received the Nobel Peace Prize in 1965. But Marie and Pierre would not witness these honors. Marie soldiered on for another 18 years, finally succumbing to radiation-induced leukemia in 1934. Eleven years later, two atomic bombs fell on Japan; the triggering devices were made possible by polonium—the element she and Pierre had discovered and by which she had hoped to bring honor to her homeland. This is a revised and expanded version of the biographical sketch that appeared in the Spring 2001 issue. Eve Curie, Madame Curie: A Biography, translated by Vincent Sheean (1937). Marie Curie, Pierre Curie, translated by Charlotte and Vernon Kellogg (1923).